Cheer up! They will be together in the end, one way or another. That's the feeling i wanted to express. I made the images warmer by raising the yellow and red levels, about 5 layers of background, I also used color dodge option. 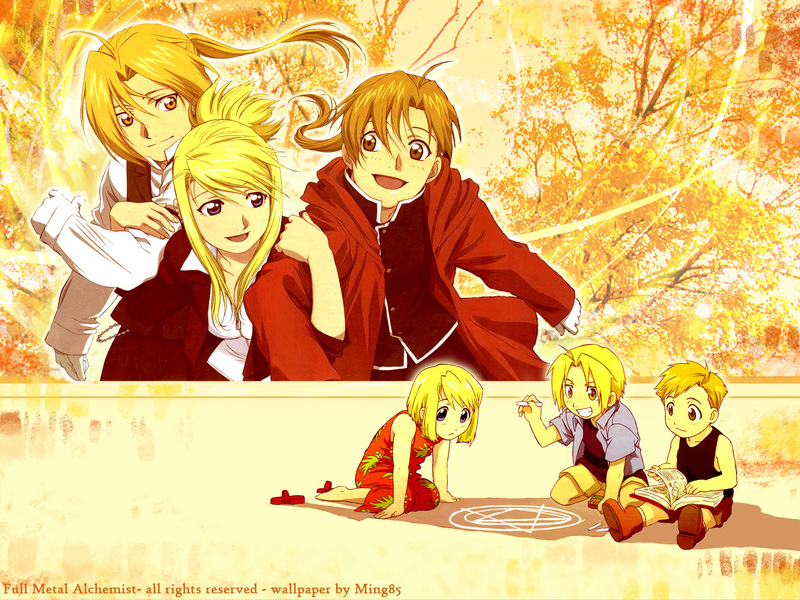 The scans missed some parts that i redrew: big Ed's hand and Little Winry's shoe for example. oh my! they looks so cute in that pic where they are young! i love that!! and that scans og the grown up just lovely, and the background is very warming! This is cute! Seeing them younger and then all grown up. Adorable. This is really really lovely. I love the use of gentle colours. It makes it feel so warm-hearted. Nice job. awwww this is soooo sweet! They look so happy back then! This is a really great wallpaper. I like the colour tones that you used to make it warm and intimate. Fantastic wall! it brings out the peacefulness and innocence as children...great job! I adore this wallie...after seeing the movie i've had this one up on my desktop for a while. Everytime i see it reminds me of the ending. Oh..only if the movie turned out they way ur wallies portrays...sigh. Still great job! AWWW THEY LOOK SO CUTE WHEN THEY WERE YOUNGER thanks for sharing !